I may as well confess now that I adore snooker on television. More ink has been spilled over the phenomenon than on any other subject so I don’t propose to add to the swell of secondary and tertiary source material that will burden the research students of the future by saying too much on that head myself, but this I will say – my, this is a long sentence, it’s getting decidedly warm, I think I’ll open a bracket (there, that’s better) – watching snooker reveals more about the psychology of homo ludens than any other game I know. It is, to me at any rate, infinitely rewarding and reassuring to see that professional sportsmen undergo the same tortures, reveal the same vanities, simulate the same indifferences and gallantries and are prey to the same tempests of emotion as we rabbits. Talk of rabbits brings me neatly to Kenneth Williams, whose twitching, dilating nostrils seem to me to suggest some descent from our fluffy long-eared friends. The redoubtable Kenneth took over Wogan for a week late in April, while Erin’s favourite son took a long overdue holiday. I, the superscribed, your daring correspondent, had the interesting fortune to be invited onto the programme as a guest. There is almost no risk I will not take, no hardship I find myself unprepared to endure in my ceaseless quest to bring you the inside stories, the scandal and the gossip from the world of your favourite entertainment medium. 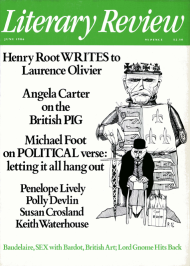 You are thus, as a subscriber of the Literary Review, uniquely placed to get the lowdown on how Wogan, the show not the man, is put together – how the man is assembled is beyond the wit of any to tell. It all starts with ‘The Researcher’. The Researcher, in my case, was a pleasant girl from the Wogan office who came round to my house with a little tape-recorder. She apologised for the mournful fact that the show demands not insights, no searing self- revelation, not autobiography but, in a word, stories. Despite my tender years I am well into my anecdotage, in Disraeli’s happy phrase, so I was ready to oblige. I spouted into the recorder for two sides of casette tape. On the day appointed, Wednesday, I arrived at the BBC Theatre in Shepherd’s Bush Green feeling nervous and on edge. It was as though of Lethe I had drunk. All my anecdotes had flown out of my head, every detail of my personal history was forgotten. I could remember that my Christian name began with an ‘S’ and that I used to be younger, but that was about it. At the stage door I was handed a key and escorted to a dressing-room. A small room, but ideal for throwing up nervously in. What was I doing here? I paced up and down, retching heavily and heaving wretchedly. After an age, the Researcher popped her head round the door. ‘Thank goodness you’ve come,’ she said, ‘we’re a guest short. Julian Critchley cancelled, so everyone’s going to have to speak for longer.’ So saying she produced a piece of typewritten paper on which were set down ‘Kenneth’s questions’ to me. Spewing distractedly, I agreed that these seemed fair and fine, and in a moment of uncharacteristic candour owned to being a year older than was claimed in his introductory piece. ‘Good. Come along to make-up them,’ she piped, and led me away from the Vomitorium down some stairs along the corridor and into a large mirrored room, where Kenneth himself was being made up. He seemed quite at his ease, dictating alterations to his script in those familiar nasal tones and chatting amiably to all about him. I re-examined the script worriedly. The next hour passed in something of a haze but I can reconstruct the essentials for you. After the making-up process has been completed the guest is led to ‘hospitality’, a room not unlike the first-class lounge of an airport, but without the magazines. It is dominated by two large television monitors and a huge trolley of alcoholic drinks. Because the programme is live one monitor shows the transmitted output of BBC 1 and the other what’s going on in the theatre; at precisely 7 o’clock the two pictures are one as Wogan goes on air. The guest is led gently to the wings and sat down to await his turn. The moment, when it comes, is anticlimactic. Kenneth Williams, not unreasonably, ignores his cue cards, to give them their kindest name, and says the first thing that comes into his head. Something then inside the guest’s head explodes and speech pours out. Kenneth listens attentively with his face while with his whole being he watches the floor manager count off the remaining minutes of the conversation. Suddenly the hand shoots out to be shaken: ‘Thank you so much for coming in, very best of luck’. To enthusiastic applause the guest totters away, off camera, to see what he can do about sucking Hospitality dry. Meanwhile the next one is wheeled on. An extraordinary process, to have one’s withers so well and truly wrung by what is, after all, only a measly chat-show. Never can the self be so completely split asunder from the being as under such circumstances. One watches one’s self curiously, from a great distance, quite uncertain how one will react before the cameras. Will you be chatty, voluble, witty, fluent, agreeable? Will you be tongue-tied, nervous, aggressive? You realise that the ‘you’ who asks the question is quite a different person from the ‘you’ of the question. Whatever happens, like the snooker player who wonders whether he will be playing well that night, you learn once and for all, in the Crucible of Fear, that you have no control over yourself. The Will has not a tithe of the power of the animal it inhabits. Dread thought! Naturam expellas furca, tamen usque recurret. You can beat Nature back with a pitchfork, but she’ll soon come roaring back again.